Scaring the record collectors away. This record was put out by Diskos which was a record label in Sarajevo, Bosnia-Herzegovina (Yugoslavia at the time). The lower right “platinum” designation suggests that the record was a bestseller. I’m not quite sure how many units needed to be pressed to get this rating. Probably not more than 8,000 which makes this record a rare find in spite of the label’s obvious desire to harness the marketing power of a meaningless “platinum” logo. The title reads “I Am Wounded Like a Bird.” Ornithological references make for emotional metaphors. As powerful as this title is it suggests weakness and fragility. Bajo on the other hand looks like a forward leaning orangutan who has just recently mastered the sitting skill. There’s never been a more inappropriate singer/song match. If Bajo were a bird he’d drop off a tree like a rock. So what about this singer named Bajo? All wrapped up in a sparkle generating striped suit like a Christmas gift from a cheap relative. His physique suggests the ability to produce guttural sounds deeper than Barry White’s midnight moans. I don’t know if it is the imperfection of the photographic equipment of the day or a birth defect but Bajo’s head is extra wide. Well, he certainly needed a lot of room in there to memorize all the lyrics. We’ll never know what happened of Bajo. Does he know what an MP3 is? Is he still a dapper man or he prefers casual wardrobe? Does he travel around the world a lot or is he confined to a solitary cell on the men’s block? Does he still sing like a bird or he robs people for living — both possibilities seem equally unpleasant. 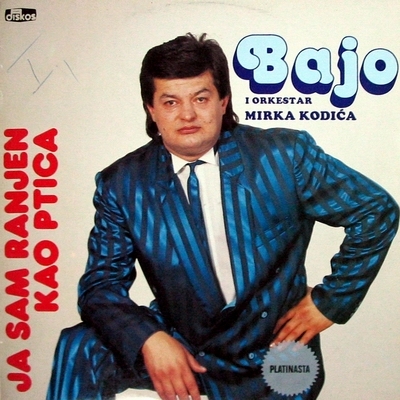 This entry was posted in Records and tagged Bad record covers, bajo, bosnia, folk. Bookmark the permalink. One Response to "Wounded Birdy"
You’re welcome prick. Trying to sneak spam links mofo!